NGO News blog, NewsLine: Key aspects of affordable housing in Trichy slums-Self-reliance, low-cost, conservation, employment, sustainable life-style. Key aspects of affordable housing in Trichy slums-Self-reliance, low-cost, conservation, employment, sustainable life-style. With this rapid urbanisation, one of the biggest challenges will be providing affordable housing to city slum dwellers, especially the poor. Housing is integral to the well-being of a family. Over a billion people around the world live in appalling conditions of urban slums lacking the benefits of adequate housing. In India alone, about 100 million persons live in slums and slum-like conditions without adequate basic facilities such as piped water, sanitation, schools, health, and so on. These numbers are expected to touch 200 million by 2020. In Trichy city of Tamilnadu around 20,000 families lack affordable housing in the slum areas and most of them are members of women self help groups. There are now and then fire and seasonal flood catastrophes affecting the slum dwellers. There is a need for adequate homes on serviced land spread across the Trichy City especially near employment centres where people can live at affordable costs rather than squatting on vacant lands. Such housing pockets could be developed by government and Non Governmental and corporate bodies. NGOs and other civil society organisations are to be involved in planning houses for the poor in terms of design and facilities. They can ensure the involvement of the urban poor in housing and resettlement efforts so that the plan is developed by those who have to be settled and relocated.NGOs can also play an important role in loan recovery by encouraging and facilitating slum Self Help Group Members communities to save part of their earnings in recurring deposits and by making SHG supports available to them. Facilitating such regular savings helps the more vulnerable families to benefit from such housing schemes. It is also important to look for new methods of land use planning and management factoring in the population growth projections. Housing the poor is an urgent and important need for building socially inclusive communities offering equity of life for all. What we need is accurate planning and mainstreaming of the urban poor in the economic growth story of our urban areas. The situation gets aggravated with every passing year as the demand for affordable housing grows with increase in population and there are limits to the extent to which the society can mobilise funds for its citizens. SEVAI, a Trichy based NGO has undertaken affordable housing with cost effective approach for slum dwellers of Trichy city whose homes had been affected by fire and also floods. The houses had been constructed at the house site owned and authorized by City Corporation. A major constraint in meeting this demand is the spiralling cost of land and other building materials. The answer to the rising cost of building materials is to use cost-effective building technology. The results of the use of cost-effective technology is logical and as per proven adoption of technology for intended purpose. Buildings using this technology have been constructed at costs much below the projections and without compromising strength, durability, safety or aesthetics. 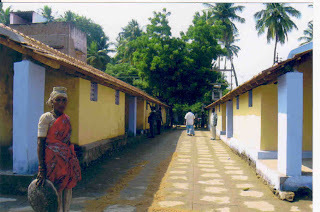 SEVAI Rural housing energy efficient housing technology has been applied in the construction of around 100 homes at a span of 45 days in K.Abisekapuram Division of Trichy. Cost-effective technology had been adopted and this cost effective housing is a collection of strategies that use innovative materials and /or techniques without compromising the structural and functional requirements and produce a holistic design to construct buildings at a cost far less than what it would take normally. The main aim of such technologies is to introduce savings without compromising on the strength, durability, comfort and elegance. It should be clearly understood that these technologies are not low-cost or cheap at the expense of quality. Hollow Block wall practice has been applied such a way that strength is equal to standard 9" (229mm) brick wall, but consumes 20% less building material. The air medium that is created by the bond helps maintaining a good thermal comfort inside the building. As the construction is appealing to the eye from both internally & externally, plastering is not necessary.